Crosley is stepping up its game with an amazing cooperation from legendary tonearm manufacturers Pro-Ject. 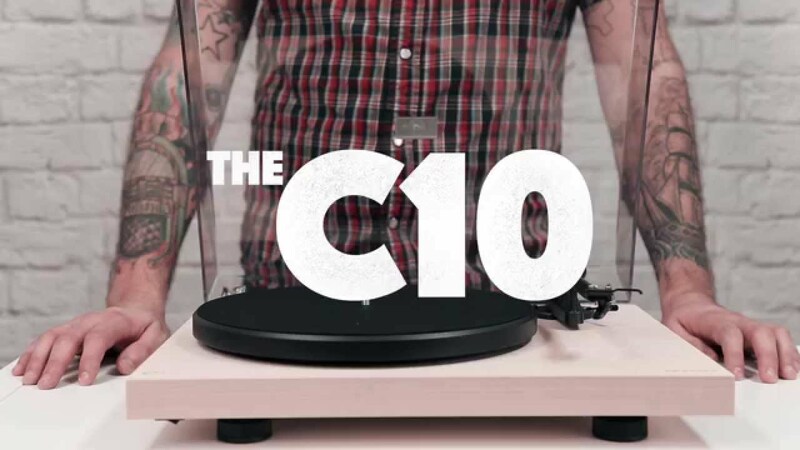 The C10 is a mashup of Crosley's vintage-infused style and high-end features. While the C10 already comes armed with an awesome pre-adjusted Ortofon OM5e cartridge, the tonearm rests on sapphire bearings and also sports counterweights to adjust for your choice of phono cartridge. Best of both worlds. Pair the C10 with the phono preamp of your choice to completely customize your listening experience. The plinth is constructed with audio-grade MDF encased in genuine birch veneer, polished to a satiny finish. So fresh! The turntable is belt-driven, so it can play at 33RPM and 45RPM with the flip of a switch. The platter itself turns on a stainless steel bearing running in a bronze bushing with a Teflon bottom. The small feet on the bottom of the plinth are shock-resistant to keep vibration as minimal as possible.